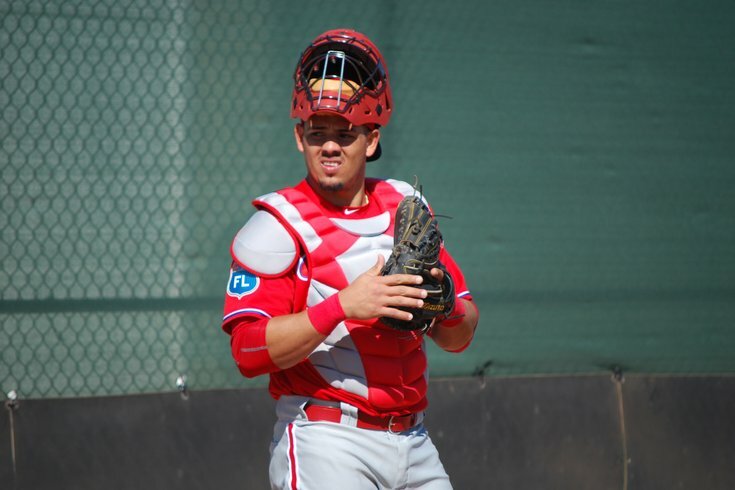 Jorge Alfaro may have been the best prospect the Phillies received from the Texas Rangers last July in the Cole Hamels’ trade. He’s a catcher that some say has a Pudge Rodriguez-strong arm and serious home run power, too. Alfaro’s only issue in the last year has been an ankle injury that required surgery and limited him to 49 games last season, stunting his development. Unfortunately for the Phillies, his development will be stunted again for the next month (at the very least). Alfaro was placed on the disabled list at Double-A Reading with an oblique strain. The timing for injuries is never ideal, but it’s particularly crushing for the 22-year-old Alfaro: he was hitting .500 (18-for-36) in his first eight games of the season with four doubles, a home run, a triple, and 10 RBIs. Alfaro was named the Eastern League player of the week on Monday. Oblique injuries are always troublesome and almost always take at least 2-3 weeks. Cody Asche suffered an oblique injury in late February and remains sidelined (although he suffered a setback when he re-aggravated the injury while rehabbing in a game, about a month after the initial injury occurred). But Asche’s ordeal serves as an example: oblique injuries are almost always handled with caution. So regardless of the severity of Alfaro’s injury, it would be shocking to see him back in Reading’s lineup for the end of May. Asche, meanwhile, is expected to resume baseball activities soon.